Development and release of aroma compounds from food products is dynamic. Conventional analytical technologies are poorly suited to studying changes on the seconds to minutes’ timescale. Separation Science, in collaboration with Syft Technologies, has produced an on-demand webinar that introduces selected ion flow tube mass spectrometry (SIFT-MS) – a recent introduction to the flavor chemist’s and new product developer’s analytical tool kit. 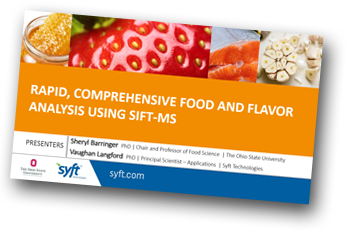 SIFT-MS analyses chemically diverse flavor compounds in real-time, including amines, organosulfur compounds, and volatile fatty acids. in vivo assessment of “garlic breath” deodorization. The fundamentals of the selected ion flow tube mass spectrometry (SIFT-MS) technique, including its ability to selectively and comprehensively analyse samples in one, simple procedure. How real-time analysis using SIFT-MS can provide great insight into flavor generation and flavor release. How direct analysis can simplify workflow and speed new product development.